What I made for dinner tonight. 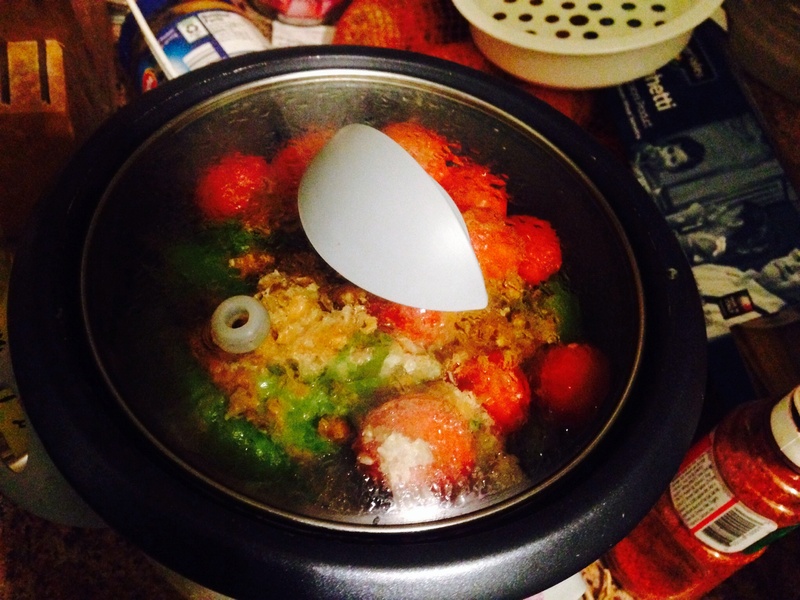 After the astonishing popularity and success of my previous article about my rice cooker and how to cook cheap on the go, it seemed like a waste not to do a second recipe. Tonight’s recipe is inspired by the fact that giant bags of frozen bay scallops were on sale at the grocery store. So the key to tonight’s recipe is to create a sort of low fat gravy to flavor all the vegetables and especially the scallops. While scallops usually are cooked with butter in a pan, I’ve developed ways to get the most out of them in a rice cooker or similar steaming device. Most of the ingredients are common and should be in anyone’s house or car. This recipe is mostly done in the stage where the first wave of raw ingredients is initially put in with the rice in the rice cooker. As such it’s important to make sure all the major ingredients for flavor are added at this stage. -2-4 cloves crushed garlic, mixed in. Cook until the rice cooker clicks off or the grains look like they’re done. Once this looks good, scoop out the results into a medium sized pyrex bowl or other bowl of your choosing. At this stage, squeeze lemon and lime or use equivalent juices. Drizzle a bit of olive oil. Some parsley flakes and pepper and maybe the tiniest bit of table salt. Mix together. Eat. Possibly good done up with spiciness. I will investigate this in a future column. You have a car? Check your privilege my friend. When I was your age I was riding Greyhound, and eating cold peanut butter sandwiches. You did it wrong dude.